Part Two: Cousin Marisol (names have been changed) is a freelance journalist who has carefully planned our itinerary, to make the most of our stay in Venezuela. Today, we are going to the Teleférico on the top of Mt. Ávila. It is one of the highest points in Caracas, overlooking the city which is located in a valley. The bell captain at our hotel hails us a cab. Like most hotels in the U.S., there are taxis waiting outside for the guests. These cabs, however, have been carefully preselected by the hotel. They are driven by trustworthy drivers and, for added security, they are unmarked and have tinted windows, which helps to ward off drive-by shootings. The thinking being that if a gunman doesn’t know who is in the car, they will be less likely to open fire. 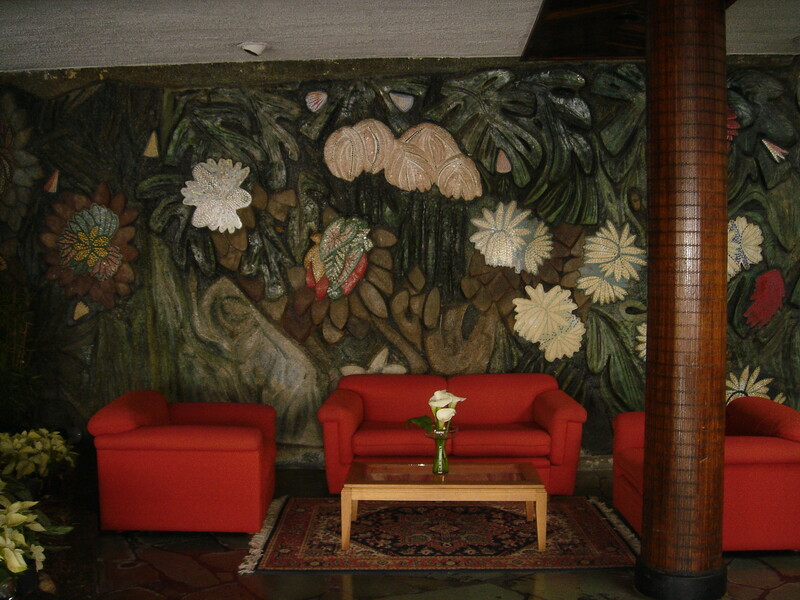 One of the murals I came across, located by the entrance of the Central University of Venezuela. I wonder how many find this display convincing. How long does it take to become indoctrinated? Just how many have become mesmerized by Chávez’ PR machine? As I ponder this, I can’t help but feel relieved that my parents are no longer around to see what is becoming of their country. We arrive at our destination. I remember visiting the Teleférico as a child, but in recent years it has gone into disarray. The government has taken over operations, though the Hotel Humboldt, located on the top of Mt. Ávila, and once one of Venezuela’s crowning achievements, remains closed. Marisol has pulled a few strings so that today we will get a private tour. Marisol has brought with her two of my mother’s siblings: Tío Francisco, Marisol’s father, who is a retired pediatric doctor; and Tía Olivia, who now lives in a home run by nuns. I remember that Tía Olivia once lived just a few blocks from the Palacio de Miraflores, the home of the Venezuelan President, much like our White House. I ask her whether Chávez is living there now. “No. No one really knows where he lives or where he is on any one day,” she replies matter-of-factly. Marisol adds that this is, presumably, a security measure, and that Chávez lives in constant hiding. Apparently, he is fearful of lurking assassins. 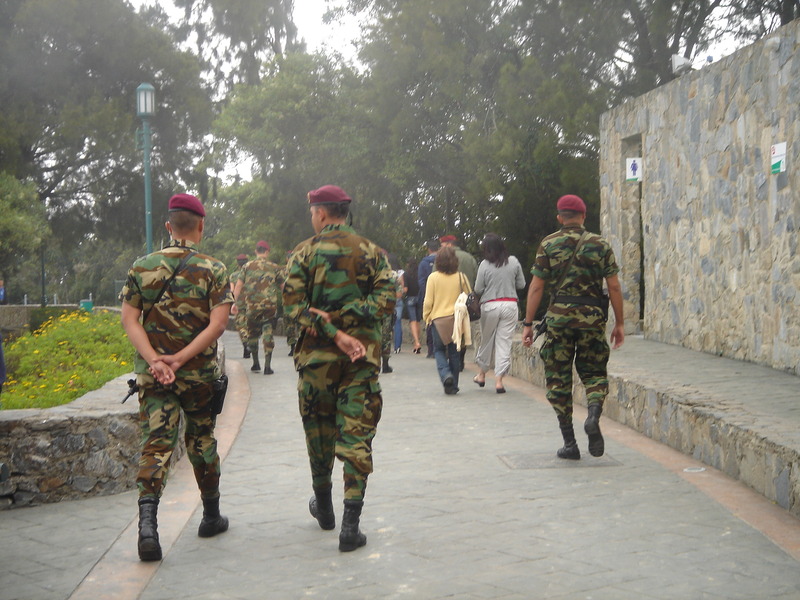 Chavez' military patrols this tourist attraction. We prepare to board the cable car that takes us to the top of Mt. Ávila. Once there, I notice the soldiers. I’d already seen a few in Caracas. But here they appear everywhere, carrying their rifles and wearing their red berets. Red being the color of the Socialist revolution. The soldiers are pacing or standing at attention as lookouts—protecting the Teleférico from what, I don’t know. All I see are Venezuelan families and a few tourists. It is the soldiers themselves that seem threatening. After our tour of the Hotel Humboldt, we lunch at one of the restaurants located on the mountain and are seated next to a table of soldiers celebrating a birthday. As they sing “Cumpleaños Feliz,” many restaurant patrons join in, but, to me, the singing feels forced. Perhaps I’ve seen too many World War II movies, for I am associating this moment with a scene from “Casablanca,” in which German soldiers in Rick’s Café Américain sing their patriotic anthem and French loyalists drown them out by singing La Marseillaise. It is one of the most stirring, powerful moments of the film. Nervously, I consider standing up and singing the Venezuelan national anthem, which I learned as a child: “Gloria al Bravo Pueblo” (Glory to the Brave People). But fear prevents me, as there’s no telling whether the other patrons will join me in drowning out the soldiers. Where is Humphrey Bogart when I need him? Time has stood still in the lobby of the Hotel Humboldt. In the evening we go to Tío Francisco’s house. I lived in this neighborhood once, when I was attending private school here. But now it’s different. Walls with barbed wire have been built around the community’s periphery. There is a security guard at the entrance and each home has locked gates. The walls around my uncle’s house have broken bottles with jagged edges along the top, making forced entry unlikely. I wonder if I could live like this and accept what has become the new normal. And yet I know the answer. We are human after all, capable of doing anything to survive. More cousins have joined us. We reminisce about the idyllic days of our youth. The conversation soon turns to politics and I sense that my cousins have resigned themselves to enduring life under Chávez. To them, he is an annoyance. A burr in their shoe. Quietly they pray that the U.S. intervenes and stops him. We change the subject and talk about the upcoming family reunion. The anticipation of the reunion excites me. Though, these feelings are tempered by what I am beginning to see as Chávez’ path to tyranny. The signs are everywhere and there’s no escaping them. At the reunion, I will find out more of what my family is feeling. Those that are preparing for uncertain times, and those that fear for their children’s future. I will also learn that one of my cousins is a “Chavista” (pro-Chávez). This blog was… how do I say it? Relevant!
! Finally I’ve found something which helped me. Many thanks! Esta historia a pesar de que la he vivido en carne propia me tiene super intrigada!. El sentimiento que tengo cuando leo esto es muy profundo, en el sentido, que veo cómo una persona que vive tan lejos, que solo esta de visita, puede apreciar en alguna medida lo que muchos venezolanos vivimos día a día. Algunos pensabamos que los extranjeros no se dan cuenta de lo que ahí pasa, y gratamente me sorprende que en pocas horas de tu visita te hayas dado cuenta de tantos detalles y cosas que son tan importante para definir esa situación. Espero el proximo capitulo!!! !.